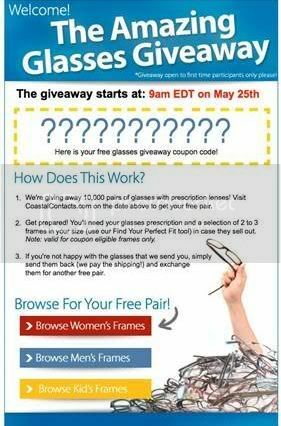 Today, Wednesday, May 25th starting at 9am EDT, Coastal Contacts is giving away 10,000 free pairs of glasses to Facebook fans of the brand. 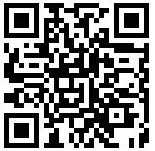 The giveaway is applicable to first-time participants in the US. 1. Visit their Facebook Page and click on the ‘Free Glasses! !’ tab on the left side of our page. 2. Click the “like” button to reveal the coupon code or if you’ve already “liked” them the code will be displayed when you click on the tab. 3. Visit their website www.CoastalContacts.com and select a pair of glasses (they suggest picking out 3-5 pairs ahead of time). 4. Starting on Wednesday, May 25th at 9am EDT, place your order and enter the coupon code at checkout to get your free pair of glasses. Preferences should be made to opt for the contact lenses instead. The cheap contacts are easily available and we can avail them for our benefits. November 16, 2011 at 11:27 PM This comment has been removed by the author. November 16, 2011 at 11:33 PM This comment has been removed by the author. wow, I have to watch to see if you do this again. I could really use these! If you are considering building a greenhouse, then spend some time looking at green house plans. There are several essential guidelines that will make your backyard greenhouses produce extraordinary crops!